Re-create your favorite Star Wars Rebels adventures with this realistic IG-88 figure! 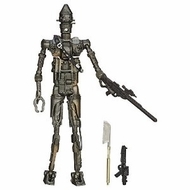 This detailed figure looks just like an assassin IG-88 droid, and he has the weapons to track down his targets and take them out. Your collection – and your adventures – won't be complete without him! Star Wars products are produced by Hasbro under license from Lucasfilm Ltd. Hasbro and all related terms are trademarks of Hasbro.